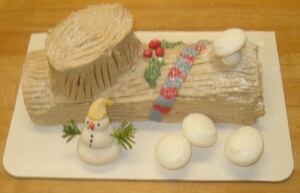 Our seasonal favorite is returning to the Holiday Menu – The Buche de Noel – The Yule log. According to the Larouse Gastronomique this cake was created by the pastry chefs of Paris around 1870 who were inspired by the real logs that burned in the hearth throughout Christmas Eve. Our yule log consists of chocolate sponge cake with mocha mousse and covered in mocha buttercream ‘bark’. To make it festive we include meringue mushrooms, a properly dressed snowman plus a scarf and holly.